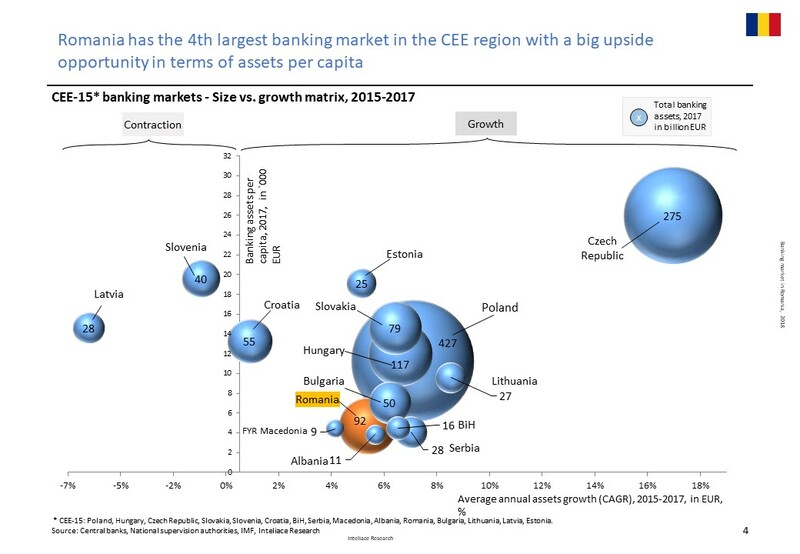 Research report: Banking market in Romania, 2018"
Total banking assets in Romania increased by 9% YoY in 2017 and they also sustained fast growth in the first three quarters of 2018, hitting a record high of RON 445 billion as of September 2018. Client deposits at banks recorded slightly slower rate of growth to nearly RON 368 billion with household deposits remaining strong. By contrast, outstanding client loans grew faster than in the past and reached RON 257 billion as of Q3 2018. The faster pace of growth in outstanding loans has been accompanied by the falling ratio of non-performing loans. The NPL ratio has more than halved since 2016 and reached 5.7% (EBA ratio) as of June 2018. The sector has also made further progress in containing currency related risks as the share of outstanding loans denominated in foreign currency has been reduced substantially, in particular, in case of mortgage loans. For more information on recent developments in the banking sector in Romania, please refer to the full publication.